The robots have gone mad! 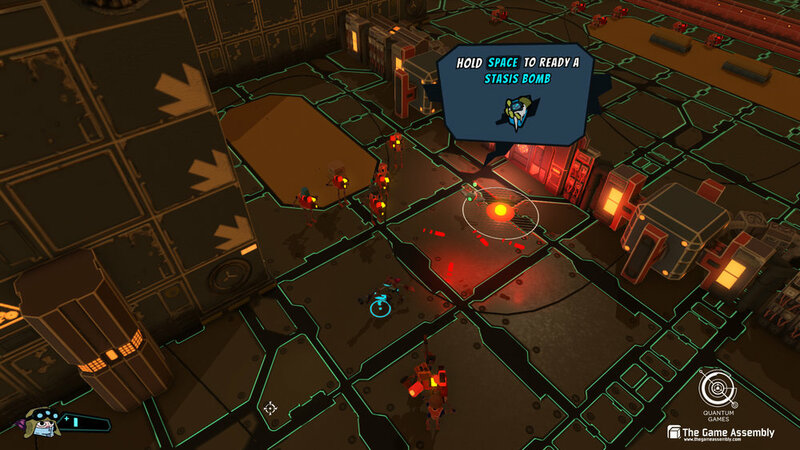 The heroine Justine Time, armed with a gun and time altering grenades, must fight through three parts city swarming with mad robots and reset to reach the mainframe before it is too late. When starting the project the Quantum Team had a harder time to reach a unified vision. The concept was harder than our previous game, focusing heavily on AI and navmeshes and as it turned out the pre-production took longer. 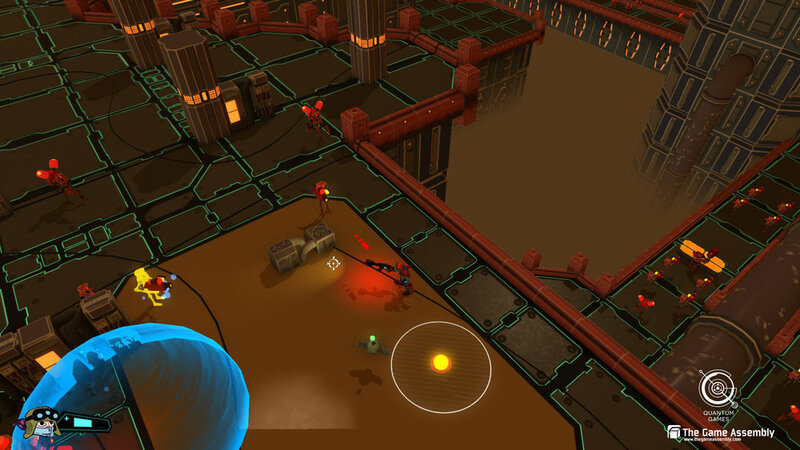 But we settled on a rapid fire shooter with call-in abilities. My vision was to create two levels with distinctive different layouts and feeling. In order to achieve this i wanted to work with elevation and scripting. My initial concepts had to be re-worked due to the constraints of the AI use of the navmesh. Instead I geared towards one level that focused on environmental interaction and one that were more geared towards waves of enemies. We were still using the same graphics engine so I decided to recycle the Path-object functionality used in my Jetburst levels. The setting was a futuristic city so I could use the paths to make subway cars part of both scenery and as gameplay elements. For my first level I wanted environment to play a more important factor so I designed it around two subway tracks going through the entire level. Since the robots could be killed as well the racks would serve as a double edged sword in large parts of the level. My second level was the final level in the game and I felt it was appropriate to go for a higher pace and difficulty. Even if I still kept environmental dangers as a component and flavor I tried to designing areas that would be suitable for scripted waves of fighting. The waves had been encountered in the previous levels but on this level I used it as the main focus on the design. Thus the layout needed more space and place to move. So my thinking was to integrate the props not only for the initial fights but for the upcoming spawns as well. In the example shown in the picture the initial wave have Robo Reboots version of tanks, shielded bots able to take and deal a lot of damage. The AI will tell them to advance while protecting the robot in the middle. Most of the playtesting showed that players tended to back away a bit before engaging them putting the player (green circle) somewhere at the end of the green arrow. 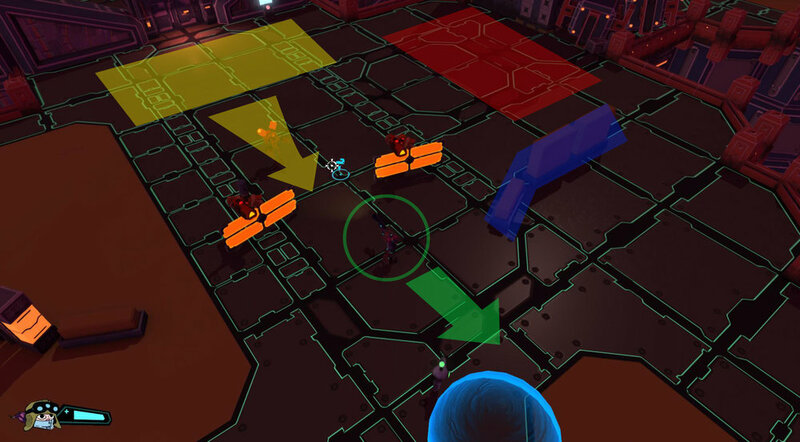 Once the first wave was defeated a second wave of about 15 robots spawned in the red area making the placement of the covers (Blue) quite important since the player would otherwise be caught by surprise in the open. In order to achieve the feeling of a living city I worked with the Artists. 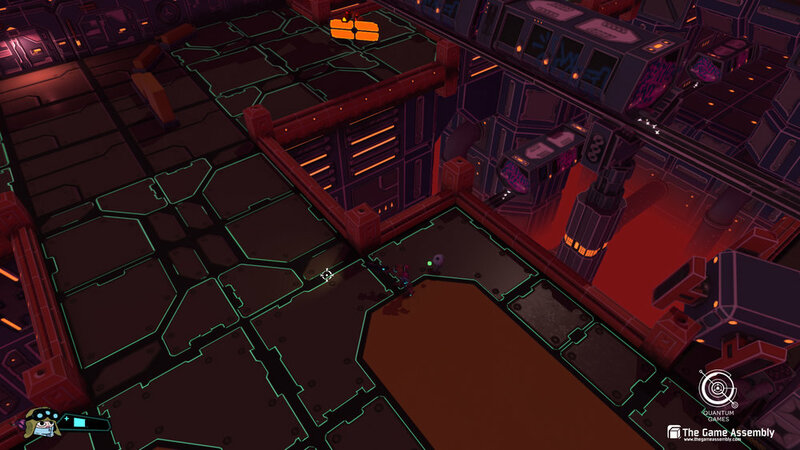 While they did the dressing for my levels I incorporated path-objects going over and under the gameplay area. As the player progressed subway cars rode along tracks making the levels move a bit more. With the colored fog that seemed to cover the bottom of the levels we managed to make the levels seem bigger and more alive than they were. With the deadline looming in closer the team paid the price for the long Pre-production. With 3-4 weeks left we felt we could not complete the game with our initial ambitions of several abilities. We discussed the case and realized that the ability that really contributed most to make the game fun was the time mechanic. Not only did it in many ways overlapped the other abilities we had but it was at the same time it was the one that stood out as something unique and fun. Once the decision was reached we were able to complete the game even if it meant some tweaking in the levels to accommodate the changed mechanics. In this project a lot of the gameplay hinged on scripts. While the programmers provided functions and the implementation of the scripts in the engine I did the level-scripting for my levels as well as general scripts used in all the levels. By using scripts I was able to make the game more interesting by setting off alarms, spawning waves of enemies, unlocking pathways and finally scripting the end of the game. The scripting was done quite late in the development process so I had to be careful not to integrate things that would create bugs. In order to avoid this I scripted in steps and when I introduced new thing I checked if the game could handle it. I think the thing I will remember from this project is that quality beats quantity every time. (pun intended). Cutting the abilities allowed the entire team to focus on making the game more fun. I'm fully convinced that even if we would have completed our initial ambitions the game would not have been better than with the one ability that we kept. The feedback we've received from the ones who played our game has all been praising the time-bomb ability as something that makes the game.